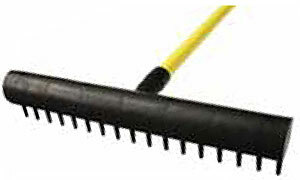 Golf cart rakes offer high-impact plastic head. Fits most golf cart well bags. Convenient, economical, time-saving bunker rakes designed specifically for carts. Shorter 48" handle and 15" high-impact plastic head fits most golf cart bag wells. Wood handle; choice of Yellow or Green. Sold in quantities of 12 Only.